"Ruby Plastic Machinery", is specialised in plastic extrusion base machineries since 21 successive years in manufacturing the finest quality range. With the constant support of our dexterous crew of technocrats, we are fulfilling the varied requirements of clients by manufacturing cf Ng vhf quality Plastic Carry Bag Making Machine. Efficient bag making machine .low power consumption and maximum production. 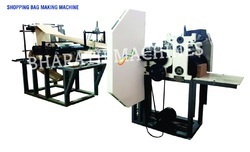 In order to meet excellent quality standards, we are supplying Paper Carry Bag Making Machine.